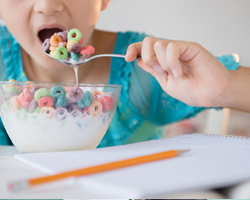 High-sugar cereal ads influence kids, up obesity and cancer risk, finds study - Healthcare Asia Daily News | Asia's Leading News and Information Source on Healthcare and Medical Industry, Medical Technology, Healthcare Business and R&D, Healthcare Events. Online since 2010. : Healthcare Asia Daily News | Asia's Leading News and Information Source on Healthcare and Medical Industry, Medical Technology, Healthcare Business and R&D, Healthcare Events. Online since 2010. Children’s exposure to TV ads about high-sugar cereals influences their food intake, which increases their health risks for obesity as well as cancers, warns research. Children’s eating habits develop during the preschool years, and children who are overweight by the age of 5 are likely to remain overweight into adolescence and adulthood. “One factor believed to contribute to children’s poor quality diets is the marketing of nutritionally-poor foods directly to children,” said Jennifer Emond, from the Dartmouth-Hitchcock Medical Centre. For the study, published in the American Journal of Preventative Medicine, the team included preschool-age children to see how exposure to TV ads for high-sugar cereals influences kids’ subsequent intake of those advertised cereals. Emond’s team purchased an advertising database and actually counted, by brand, the cereal ads that aired on the children’s TV network programmes each child watched. Parents were asked about the shows their kids watched and what cereals their kids ate in the past week, every eight weeks, for one year. “There are policy-level actions that could be implemented to reduce children’s exposure to food marketing and to improve the quality of the foods marketed to kids. And we as parents have the choice to switch to ad-free TV for our children and for ourselves,” Emond noted.